Warner Archive delivers another fun genre film from the past with the world's first Dino-Western. 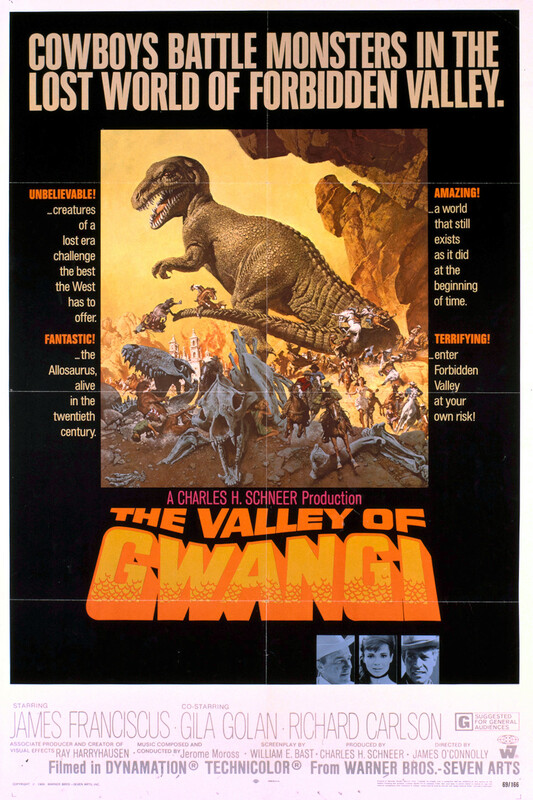 The Valley of Gwangi is a 1969 Weird Western that pits heroes at the turn of the 20th century against dinosaurs. In case you aren't familiar with the term "Weird Western," it's used to describe the melding of two genres, Western, and another, such as Horror or Science Fiction. In this case, the traditional landscape of the old west has been augmented by something that shouldn't be there: dinosaurs. This movie feels like a Spaghetti Western. It features a largely-international cast, some of whose performances are dubbed, and the project was filmed in Spain among the same hills and valleys that can be seen in movies like The Good, The Bad, and the Ugly. While this came out at a time when Spaghetti Westerns were very much the rage, it's a little surprising to learn that this is an American production from Warner Brothers and not the brainchild of an Italian director. What matters is that it FEELS like a Spaghetti Western, and this was no doubt intentional. The story for The Valley of Gwangi goes back to a script written in 1942 by Willis O'Brien, the special effects master behind the original King Kong. Because of the source, many of the beats in The Valley of Gwangi are repeats from King Kong: the hubris of man, the savagery of nature, and the tragedy of meddling with powers beyond mankind's understanding. The project was ultimately cancelled and the script was stored in a drawer, where it remained untouched for over two decades. In the mid-sixties, it was finally dusted off, handed to screenwriter William Bast for a polish, and slated for production. Jim O'Connolly (Horror of Snape Island) handles the directing duties, but the real heavy lifting seems to have been done by Ray Harryhausen, the special effects wizard who is synonymous with stop motion animation and gave us classic scenes in movies like The 7th Voyage of Sinbad, Jason and the Argonauts, and Clash of the Titans. 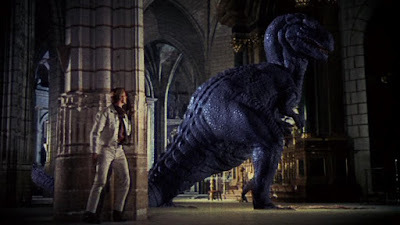 I think a lot of people would admit that Harryhausen's dinosaur effects are the reason to watch a movie like The Valley of Gwangi, and this movie is noteworthy in that department because 1) this was the last time that Harryhausen contributed effects to a dinosaur film, and 2) he spent the better part of two years working on the special effects, making them as realistic as possible. The lead actors of the film are James Franciscus (Beneath the Planet of the Apes), Gila Golan (Our Man Flint), Richard Carlson (Creature from the Black Lagoon), and Laurence Naismith (Diamonds are Forever, Jason and the Argonauts). Franciscus works as a leading man, offering us an archetype who is brave and hard-working, but also aggressive and flawed. Polish/Israeli model and actress Gila Golan is very pretty and offers something akin to an Ann-Margret quality, but it's hard to say much about her actual performance, especially since all her lines were overdubbed by another, unknown actress. This is not the kind of movie that demands a lot of nuance from its leads, but they are likable and have a decent amount of chemistry together. 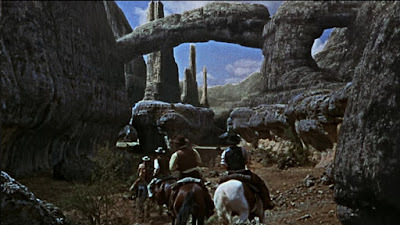 The plot of The Valley of Gwangi is perhaps even more simple than that of King Kong, though the echoes are obvious: our heroes from the old west are told by a band of Gypsies that they should stay away from The Forbidden Valley, a land where dangers beyond their capacity roam freely. Our enterprising lead sees fame and dollar signs in his eyes and decides to go check it out with the aid of his feisty female companion and an English professor. They find a land inhabited by dinosaurs and manage to capture one, which they bring back to town for display in a circus. You can imagine what happens after that. 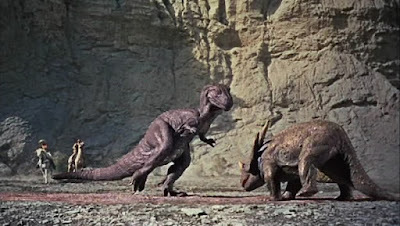 I really enjoyed The Valley of Gwangi; I'm such an easy target for movies from this time in cinema history, and I love the idea of dinosaurs in a classic western setting. That being said, I'm not sure who I'm supposed to be rooting for here. The heroes act very selfishly and pull a native creature literally kicking and screaming from its home, where it isn't bothering anyone. On one hand, I think that I'm supposed to sympathize with Gwangi, because he's clearly a dominant force in this movie, much like how Godzilla became a hero in his own films, despite being a terrible source of destruction. Really bad things go down in this movie that make the humans seem awful. I would think "Oh, they got what they deserved," but then the movie ends with a very heroic credits montage featuring all the actors who had just been horrible to nature. Am I supposed to be on their side, or am I supposed to want them all to get eaten? It's kind of like if every single character in Jurassic Park was Dennis Nedry. It's weird to me that everyone who talks about this movie online or even in the documentary included on the disc only mention the special effects and no one really has anything to say about the characters or their questionable choices. You could debate their actions and discuss the moral implications for days. Then again, I also recognize that I'm supposed to marvel at the spectacle, and that's easy to do because everything looks so cool. Gwangi faces off against everything from rival dinosaurs to a stop-motion elephant! Harryhausen was arguably at the pinnacle of his powers when this movie was created, and the cinematography of the arid Andalucian landscapes are fantastic.This movie fits right in with our myth of the American West, and the added dinosaurs make for a great ride. The score by Jerome Moross is absolutely classic western stuff, with big, sweeping motifs that invoke dusty trails and high adventure. The Valley of Gwangi and some of the other dino pictures from this era had a huge influence on some of the people behind our big blockbusters today. In an era before CGI and superheroes, not much was better than watching a rugged hero and his pretty companion venture into a dangerous land to bring back something terribly dangerous. In terms of adventure and watchability, the movie has held up remarkably well. Warner's HD presentation for the Blu-ray looks amazing, thanks to the copious amounts of natural sunlight and location cinematography, and most of the film looks like it was shot yesterday. The only dips in quality occur during the many stop motion animation sequences when grain spikes due to the 1960s effects procedures. I have no doubt that The Valley of Gwangi has never looked better than it does here. My only real contention with the movie at all is in the lack of human decency from its leads, but maybe that was an intentional choice on the part of the writer and director. If you're a fan of midnight movies or historically-important genre films, this is definitely one to pick up.